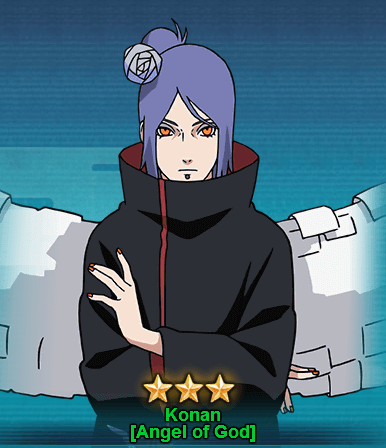 This is the new Konan character added to Naruto Online game after 26th April 2018 server update. I will move on publishing Konan [Angel of God] ninja character before Normal Konan. As you all know, Konan was the closes aide to Nagato and student of Jiraiya. She was a founding member of Akatsuki. Upon Nagato’s death she led the Village Hidden by Rain and was killed by Tobi@Obito when Obito was finding Nagato’s corpse for his Rinnegan. Ninjutsu Shikigami Dance [Prompt]: Causes certain damage, 3 COMBO and Tag up to9 units of the opponent’s formation and will cause High Float to a selected opponent’s unit. Taijutsu, Ninjutsu Paper Blizzard – Wave: Attacks the opponent’s front row, causes Tag, has a chance of causing Knockdown. Will also immediately reduce its Mystery Skill’s Cooldown Time by 1 round. Ninjutsu Shikigami Dance – Protection: Becomes Immune to Low Float, High Float, Repulse and Knockdown. Your unit will increase its Ninjutsu and COMBO Rate by 1% for each Chakra point that you possess. As you can see Konan [Angel of God] was just introduced and only available in the Lucky Stars Wheel event where you can redeem you lucky stars from 26th April 2018- 2nd May 2018. Konan [Angel of God] might be available in other events in future. I will keep you updated if there are any other ways to get Konan [Angel of God] in future.